These Breakfast cakes are inspired by Ani Phyo's .. 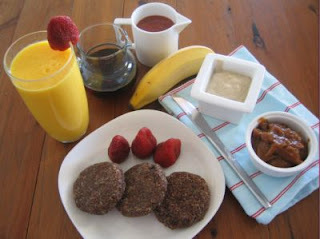 This is the breakfast I gave my husband Craig on Day 5 of his 10 days raw journey. Mix all ingredients in a bowl with just enough water to make a firm dough, add the water slowly so as not to over do it and make them too runny. Shape into balls then flatten into flat round pancake shapes then place in the sun for about an hour. Whilst they are doing there sun baking you can prepare the Cashew Cream and Strawberry sauce. Place strawberries, dates and date water into a small blender and blend until smooth. Rinse cashews then add all ingredients to a small blender with about 1/4 cup water. Blend until smooth and creamy. NOTE: I use a personal blender like the Tribest or the Magic bullet for the cream and sauce. I find them fantastic when you only want to do a small quantity.